It was only a matter of time before Sony dipped its toes into the burgeoning world of 'DSLR-like' cameras. offering interchangeable lens systems and more features than most simple snappers can handle. 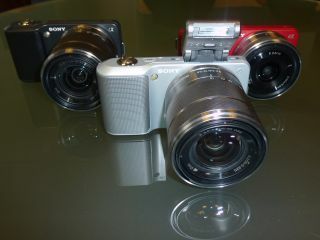 Sony has come to the table with two offerings: the NEX-5 – which we featured last week – and the NEX-3. Both are compact cameras with interchangeable lenses and both are true to their compact roots. The NEX-3 is as compact as you can get for a camera that houses pro features. It's surprising then that at the heart of the NEX-3 is the APS-C sensor. This is the same as what is found in Sony Alpha range of DSLRs and is a bigger sensor than that found in other cameras of its type. Immediately this means that low-lighting shooting is going to be a breeze (it can shoot to ISO 12,800) and picture quality precise – the camera packs 14.2MP. The NEX-3 feels different to any other camera we have picked up. This is to do with the material the body is made from. Sony have gone for polycarbonate plastic and not the metal found on the NEX-5. While we prefer the feel of the NEX-5, the new look chassis of the NEX-3 does stand out. And it comes in a number of different colours, including red. Other than the chassis change, the only difference is that the NEX-5 only shoots 720p video and not 1080p. This is no big thing, considering this is the cheaper camera. There are minimal controls on the NEX-3. The main thing of note which is missing is the Mode dial. What Sony has done is integrate this technology into the camera's menu. Dig into the menu screen and a massive virtual Mode dial which you flick round using the control on the back of the camera. Not only does this mean that there's less clutter on the body, Sony can also explain what each feature on the Mode dial does. This is a good move by Sony as it will aide those who get turned off with the myriad features on offer in a DSLR. And for those who know what they are doing, you can just ignore the blurb. To help the newbie even more, Sony has also packed 80 pages of tutorials on to the camera, so you can take it out for a spin and essentially learn on the job. Another great mode is the use of Sweep Panoramic. This fantastic feature was last seen on Sony's compact range and it makes a superb appearance on the NEX-3. Essentially you slowly move the camera around and the camera will take a boatload of images, stitch them together and create a 149-degree photo. Slap on the fisheye add-on (available for the pancake lens) and this is upped to a massive 226 degrees. Not only that, from July this mode will be 3D ready thanks to a firmware update – so you can play the pictures back on your 3D-capable Bravia TV. The lenses available for the NEX-3 are the same as for the NEX-5. These include: 16mm and 18-55mm lenses, which do come in a bundle with the body. The jury is still out whether interchangeable lens systems work on compact bodies. The lens certainly does protrude in an almost comedic way from the NEX-3's chassis. But having DSLR-like quality on a camera that doesn't look daunting to use is certainly warranted, something the NEX-3 shows off nicely. The Sony NEX-3 has a UK release date of 1 June, with prices starting from £500.